When Louis reaches Level 37, he tells you that he likes his gun, but he thinks he could upgrade it as the enemies are getting tougher. 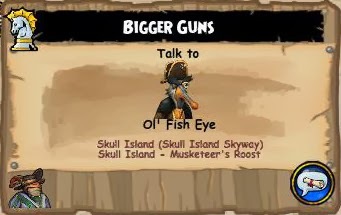 Ol' Fish Eye tells you to speak to Lucius Fox who can make you a nice harpoon. 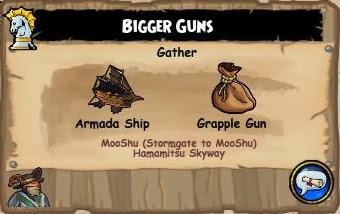 Lucius tells you to take a grapple gun from Armada Ships. 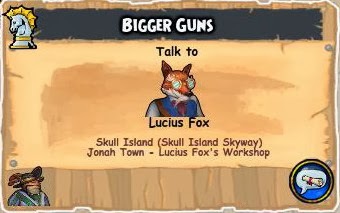 After collecting the Grapple Gun from the Ships in Mooshu, you return to Lucius Fox who tells you he needs more parts. You can get these parts from a workshop in Junction, Arroyo Grande for a trade with a Catalyzer. 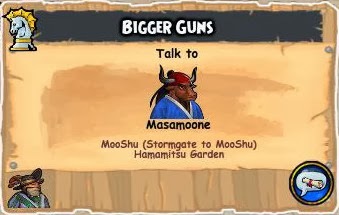 Once you return with the parts, he tells you that he is running low on fusilier powder and you will need to get some Brimstone from Tengu Sorcerers in Mooshu and something from Madame Vadima. Madame Vadima has what you need, but she needs something in return. 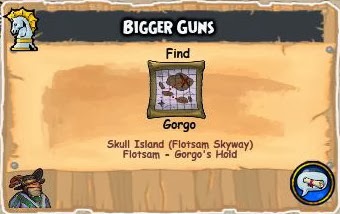 Gorgo, an evil WitchDoctor must be defeated. Lucius needs Masamoone to finish the harpoon for him, Masamoone says he will do it, for a price. Collect some Iron Chains from Inoshishi bandit's. Once you return to Lucius, the harpoon is ready and you can Promote Lucius to his latest Form!